← lightly lemon gluten free white cake – geoff’s new favorite! 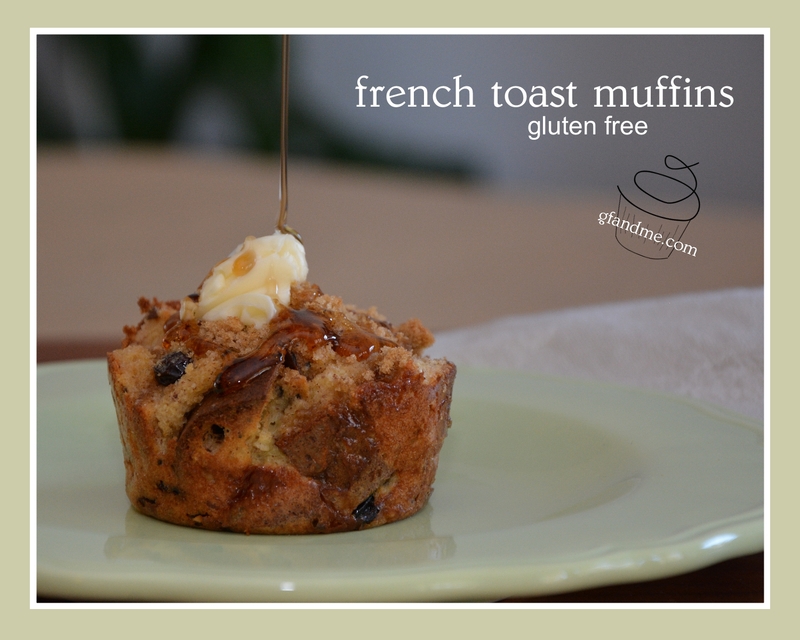 These gluten free french toast muffins taste just like french toast but without the hassle. All you have to do is mix a few things together and toss them in the oven. No watching and flipping required – making them perfect for brunch! Of course you can use fresh gluten free bread, but if you’re like us and have a few bags of stale gf bread in your freezer, this is the recipe you’ve been waiting for. Whole grain, white, poppy seed, raisin – all will work wonderfully. Scroll down to find the recipe. Shred or cut the gluten free bread into cubes and put in a bowl. Add the raisins. Sprinkle with the cinnamon and nutmeg and toss to coat. TIP: Some gf breads will retain their shape (like Our Compliments) and others will go – for lack of a better word – mushy (like Dempsters Gluten Zero). Both work just fine. One will result in more a bread pudding look and the other will turn out more like a regular muffin – especially if you cut off the crusts. In a separate bowl, mix the eggs with the milk and the granulated sugar. TIP: If you don’t like sweet, you may want to cut back on the granulated sugar. The recipe results in a pretty sweet breakfast – especially when topped with brown sugar and syrup. Once the oven is heated, add the egg mixture to the bread cubes and toss to combine. Transfer mix immediately to the muffin cups making sure to divide the liquid equally. Once in the cups, press each muffin down with the back of your fingers (or you could use the bottom of a glass but where’s the gooey fun in that). If you don’t compact the muffins, they may fall apart and you could end up with something more like croutons than a muffin. If you want, garnish each with a bit of brown sugar. Bake regular muffins for 20 minutes and Texas Size muffins for 25. A toothpick inserted into the centre should come out clean and the tops should be toasted a golden brown. This entry was posted in Baking, Breakfast & Brunch, Recipes and tagged bread, gluten free, muffins, quick and easy. Bookmark the permalink. Hi Carol. In the muffins themselves, I use 2 tablespoons of granulated sugar. On top, I just sprinkle a bit of brown sugar. It makes a sweet caramel-like topping. Oooh! I love this! I’m going to try it. The miracle of the muffin tin! So true. They really are miraculous!